The permeation of affordable devices combined with analytics, cloud computing and an escalation in consumer expectation is fuelling the IoT growth wave. IoT offers a tremendous opportunity to organizations to engineer innovative products and services, serve up additional revenue streams and drive down operational costs. As a gamut of vendors pool in to take part in this revolutionary concept, one must deal with the shortcomings of using this technology as well. With each device being connected, privacy and security concerns surrounding IoT also increases. These concerns range from hackers stealing critical data to organizations easily uncovering private data that is carelessly handed over to them by us. However, most solution providers address security concerns post designing and implementation of the solution. Steering away from this approach, Kerala headquartered Infiny think Engineering proffers their novel IOStash platform that has specifically been engineered around security. 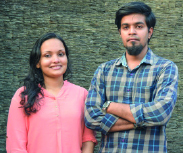 Aravind VS and Kavya Babu, the founders, explain that the platform is not just a block in the IoT puzzle but is, in fact, an entire end- to-end solution for building connected applications and experiences. Aravind attributes the group's foresight to its advisors, Manulal and Rajesh Mohan. IOStash puts a huge emphasis on security right from data collection to transmission to Extract, Load & Transform(ETL)processes. IOStash permits users to utilize their own or other database services to store their data at their own infrastructure. All data traffic through the IOStash data delivery network is encrypted and secured using dynamic rolling keys. Additionally, it supports hardware-based encryption mechanisms. “Our continuous R&D process helps us in finding multiple ways to make IOStash rock solid in terms of security and resilience,” reveals Aravind. applications and mobile apps thereby enabling users to deliver the best product experience to their customers. Offering a wide variety of analytics tools via its software dashboards and custom enterprise integration APIs, IOStash empowers its users to gain valuable insights into their services and generate new revenue channels. Another added advantage is that the platform can be seamlessly integrated into any application of any size. This is achieved using lightweight Software Development Kits(SDKs)that assures the data is received in real- time within seconds, something that multiple providers are still struggling to get going with simple one line integrations. With a thorough analysis of current technology and market trends, Infiny think envisions focusing their operations on three major verticals-healthcare, automotive and agriculture. “IOStash as a product has the technology to implement IoT solutions in the industrial landscape through gateway hardware and data collection endpoints,” adds Kavya. Enthralled by their progress in the IoT domain, the group intends to work on building specialized platforms on top of the proven reliability of IOStash with configuration and management options specific for each vertical. Solution developers and OEMs can then leverage it to create complex IoT applications from a more focused standpoint. Furthermore, the company envisages expanding their footprint and is in the process of acquiring more management and sales talent.